It wasn't until the group were getting close to the mountainous range they had seen from earlier that Jinny told Shady to slow down. The Gallion complied, spreading his wings out and letting the wind and rain carry him. Laerya sighed as the rain soaked her hair, its cold touch soothing her. She breathed in deeply, ridding her body of the adrenaline that pumped through her veins during the fight with the Korbat. Now that they were safe she was allowed to slow down her beating heart. Unfortunately one glance at Akorri shattered all hope she had of gaining peace. It was like looking at a mutant Faellie; he reminded her of one now. "You didn't lift a finger to help us back there!" she accused him. The Xweetok wiped his wet red hair from his eyes. "Why did I have to?" Lae growled at his short response. "Because that's what you're supposed to do!" "Am I? Who says I wasn't on the Korbat's side?" Laerya lifted a fist to punch him. She wanted to, so badly. That remark stung her deeply and made her realise how far Akorri was into his new state already. She didn't like it. No, mere disdain was too weak an emotion for what she was feeling. She hated this Akorri. The real Xweetok would have at least tried to help his friends because he was so loyal, if a little cowardly. But the implications of what this Akorri said – that he would have been happy if the Korbat succeeded in her mission – pushed Laerya over the edge. She was both angry and afraid of this Xweetok now. Yet despite the burning hole in her heart she unclenched her fist and let her hand fall dejectedly. Violence would do no good; it never did. "Who are you?" she murmured. "You're not Akorri." "I am. I'm just different." A purple spark ran through his body. "But I know you don't like that. I know how much you miss who I was before. But guess what? That part of me is fading right now." Lae closed her eyes, trying not to let Akorri get to her. Lashing out at him would only make things worse. She turned her head as a tear ran down her cheek, blending in with the rain. "You'll s-see," she choked, "We'll get t-to the library and find that book and Feri will reverse the spell." She ran those words over and over in her head like a chant. She wanted to believe it, but the knowledge that they were being pursued hung heavily over her. Why had she expected it to be so easy? How could she be so dumb, not even thinking that Lorelei might have put obstacles in her path? Still, they got through the Korbat, and that meant they would go through anyone or anything else they needed to reach the library. They had to. There was no other option. A harsh clap of thunder sped up Shady's sedate flying pace. Hours were passing and the rain showed no signs of abating; in fact, the downpour worsened. The Neopets aboard Shady jumped as the thunder jolted them out of their individual stupors. Laerya, normally quite taken to thunderstorms (having been an electric Cybunny earlier in her life), reacted the worst, mainly because her thoughts up until that point had been uncharacteristically pensive. "Gyah, that was loud!" she yelled, still shivering from shock. Akorri smirked, though he was also visibly shaken. "You afraid of a little thunder?" "I'm actually afraid of what the thunder might do to Shady," Jinny piped up nervously. "We should go take cover," Lae decided, ignoring Akorri. She peered past Shady to see that they were approaching the mountainside. In particular was an overarching cliff, providing decent shelter from the thunderstorm. She narrowed her eyes, irritated that their trip to the library would have to be delayed until the storm passed. Shady dipped lower and gained speed, soon approaching the cliff face with the rocks hanging overhead. Jinny took to the controller's seat and landed the Gallion expertly on the rock face, patting his neck before climbing out of the saddle. Laerya hopped off Shady and looked up at the shelter. The rocky walls curved conveniently to create a roof of sorts, protecting the group from the brunt of the rain. The ground itself was firm and showed no signs of crumbling. "This is all right," she commented, "as far as shelters go." Akorri joined the others apprehensively, looking every which way to find a fault with their refuge. He settled with, "If someone were to stand on the edge, they could easily fall over." "Only you would be stupid enough to stand on the edge," Lae sighed. "You're thinking of yourself there, bunny," Akorri retorted. Before Laerya could protest, a high pitched yell caught her attention. She turned to look at Jinny, but the Kyrii looked equally confused, so the sound couldn't have come from her. Lae looked into the distance and gasped. A Neopet was flying straight towards them. A faerie Xweetok, to be exact, and one Laerya recognised almost immediately. The voluminous, puffy green hair easily distinguished the Xweetok as Kiyake, Fericeus's best friend and most trusted assistant. "What's Kiki doing here?" Lae frowned, watching the Xweetok fly towards them with great difficulty. Her yellow wings exuded light and left a trail of sparkles in their wake. She panted from the effort of flying through the harsh weather. Just when it seemed like she would fall, she put on an extra burst of energy and catapulted towards them, crashing headfirst into the ground beside Lae. "Ouch!" she squeaked, practically ripping her face from the ground. She sneezed and rubbed her nose, recovering immediately from her graceless tumble. "Hi, guys!" Laerya grinned, amused at her abrupt and causal entrance, as though they shouldn't be concerned with her being here in the first place. "Hey, Kiyake," she greeted. "What brings you here?" "After you left, Feri told me to follow you," explained the little faerie Xweetok, standing up and dusting herself off. She really was small, her full height at least a head shorter than Lae, who was already short to begin with. "So I travelled all through the day and the night and managed to catch up to you!" Akorri eyed the faerie Xweetok cautiously while Jinny looked completely perplexed. Laerya herself was confused. How could Kiyake have so much energy after travelling day and night? "You did a good job," she praised. "But why are you following us?" She didn't treat the question with apprehension, but mere curiosity. She knew Fericeus wouldn't have sent her out of malice. "I'm here to give you this." Kiyake fumbled with the brown bag strapped to her shoulder and took out a small translucent ball, handing it carefully to Lae. "Okay..." She eyed it curiously, as though its use should become apparent if she stared at it long enough. "What is it?" Kiyake tilted her head to the side in a comically exaggerated fashion. "A communicating crystal ball, duh!" she replied as if it were obvious. "And... how do you use it?" "You just tap into it and blow once or twice and bam, you have a direct link with Feri!" Kiyake hopped up and down excitedly. "Isn't it amazing? Feri and I use it sometimes. And it's not just for talking, you can see things with it too." Laerya grinned at the invention, holding the ball up for careful inspection. It was smooth, light and extremely delicate, as if dropping it once would break it. "Why couldn't Feri deliver it himself?" Kiyake giggled. "If Feri could reach you, there would be no point to this crystal ball at all, silly!" The faerie Xweetok's hair bounced as she did, creating the appearance of her curls having a mind of their own. Laerya was cheered by Kiyake's exuberance. She reminded Lae of herself if she was going through a permanent sugar rush. She needed someone like that on this trip; someone to lighten the mood and share a few laughs. Lae used to be the one to do that, but certain circumstances dampened her spirits, namely Akorri's transformation. She couldn't shake herself out of her funk, and she sensed Jinny was upset as well. Maybe Kiyake could help them emotionally as well as physically. "So are you just here to give this to us?" Akorri asked. "I dunno. I feel like I should stay and help you, you know?" Kiyake crossed her arms in thought. "I've come so far already, it would be dumb to leave." Lae sighed with relief. "We'd love to have you," she said. "Yay!" Kiyake cheered, leaping up in the air. "And I'd love to have you!" She went ahead and hugged Lae, who responded with a grin even though she was caught off guard. "This will be fun, even with Mr. Grumpy over there." Akorri glared at her. "My day just got worse," he muttered and turned away. Kiyake stuck her tongue out at him mischievously and turned to Jinny. "Oh no!" she gasped. "I'm so sorry I didn't introduce myself to you!" She took Jinny's hand (much to the Kyrii's chagrin) and shook it vigorously. "I'm Kiyake, family friend of Laerya! Nice to meet you!" Jinny withdrew her hand the moment Kiyake let it go. "I'm Jinny," she said quietly, her voice almost drowned out by a vicious thunderclap. Kiyake jumped as the noise erupted. "Whoo! That's scary," she said. "But anyway, hello Jinny!" "Yes... hello." 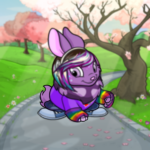 The Kyrii didn't look as cheered to see Kiyake as Lae was; she looked at the Xweetok as though she was one of those stray Petpets you didn't know if you could trust. "Aw, I can see Mr. Grumpy's already poisoned you with his bad mood!" Kiyake shook her head vigorously and crossed her arms. "Good thing I'm here to cure you!" "Great..." Jinny didn't seem pleased to be called out on her behaviour, even if Kiyake hadn't meant any harm by her remark. Laerya couldn't help thinking that Kiyake might actually add to Jinny's 'bad mood', if the Kyrii even was upset in the first place. Jinny's expression never betrayed her emotions and because of this she did tend to look like a sour Angelpuss. It was quite humorous, really. Well, not for Jinny anyway. "So what do we do now?" Kiyake asked, leaning against Shady without a second thought, even though they were even less acquainted than she and Jinny. The Gallion just glanced at her and snorted. "We rest and wait for the rain to pass," Lae said, "and then we fly to the library." "Oh, so we have to wait?" Kiyake pouted in disappointment. "That's such a waste of time!" Lae raised an eyebrow in disbelief. "Yeah, I think so too," she agreed, "but aren't you even a little bit tired? You could use this time to rest." It was Kiyake's turn to look surprised. "Me, tired? No, I could go on for ages yet!" "You sure? You can go to sleep, you know." "Well, all right then." And as if on cue the faerie Xweetok collapsed to the ground and immediately started snoring. Lae clicked her tongue, staring at the Xweetok in awe for a whole minute before simply shaking her head and grinning to herself. Just when you think you had Kiyake figured out, she would go and do something to throw your perception of her completely out the window. Lae had learned to just accept that she was Kiyake, and she was capable of doing all sorts of things, and you just had to leave her be and stop being surprised by anything she did. Falling asleep on command was just one of those things. Jinny leaned on the wall beside Akorri. "That was all so sudden," she mused. "I feel like I should apologise for her bluntness," Lae said, dazed by Kiyake's entrance, "but if you look past that, she's actually a lot of fun." "Fun isn't what we need," Akorri protested, "and her voice grates on my nerves more than yours does." Lae wanted to tell Akorri that he was grating on her nerves, but refrained because she knew the futility of her remark. What was the point in having another argument? "She's with us now and you're just going to have to deal with it." Akorri rolled his eyes. "Whatever," he muttered, much like how a teenaged child would respond to their parent. Laeyra didn't say anything, and so the group sat in careful, strained silence, tolerating each other's company until the sky darkened considerably and the rain finally stopped for the night. From noon until evening, the thunderstorm surged on, relentless in its attacks on the eardrums and eyes, and the damp smell of rain consumed Lae's thoughts, and she agonised over her journey to the library, and would they even be able to reach it before Akorri was consumed by Lorelei's magic? And throughout it all, Kiyake slept soundly, barely stirring as the particularly loud thunderclaps exploded overhead. This torturous passage of time did little good for Lae's nerves and she almost forgot to be grateful that at least Akorri was keeping his mouth shut. Yet she felt she needed to fill the silence, for it had gone on long enough – how had she managed to survive at least three hours without a single word escaping her lips? She didn't know she was capable of such acts, and took a moment to pride herself in her silence. But her patience had finally waned and her tongue wanted to flap, so she let it. "I wonder what everyone's doing back home now. Fericeus is probably studying right now. Denise will be fretting for our safety and Elora and Kyra will be consoling her. What do you think?" she asked no one in particular. "Greenglade won't have noticed I'm gone," Jinny replied, surprisingly without the bitterness such a statement would have expected. "But I would guess your family is doing all they can do stop Lorelei... from where they can." She said this quietly, carefully, as though talking about someone else's family was a dangerous conversational ground to tread. Lae smiled slightly, faintly amused by Jinny's reluctance to speak. "I guess so. I know Elora would have gone after us in a heartbeat if she could." "What... what are they like, your family?" Jinny asked shyly. "Big." Lae laughed as she spoke the first word to cross her mind. What was her family like? In one word, yes, big. Huge, even. Her family was one of those where Neopets adopted each other into their homes, and it all started with Elora. She had opened her doors to Lae, Fericeus, Kyra, Denise, Kiyake and all of their friends, so Neopets of all species came and went as they pleased, almost like a hotel. Laerya knew pets she wouldn't have ever crossed paths with normally, and her family was the gateway to her friendship with Akorri. Jinny blinked. "Big?" she echoed when Lae did not elaborate. "Big and free," Lae described, "we all look out for each other, yes, but we aren't a restrictive family. All of us have business outside of our homes, especially Feri and I, so we have a mutual understanding of just letting each other get on with our lives." Lae did not think to question Jinny about her family, and the Kyrii did not volunteer to tell any stories, so they continued to sit in silence. Laerya's eyelids slowly began to droop, and she concluded it was time to end the day. Though she was frustrated, she knew it wouldn't be a good idea to travel at night to reach the library. Kiyake was still asleep, and Akorri looked like he would soon doze off, so she told everyone that she was going to sleep and positioned herself next to Kiyake, closing her eyes and willing sleep to take her quickly. It didn't. She felt like an hour passed before her mind slowly drifted to the realms of unconsciousness, but a voice drew her awake. She kept her eyes closed, because the voice was Akorri's and therefore no threat. "Great, I feel normal for once and I have no one to talk to," he muttered. "I'm awake," Jinny's careful voice piped up. "Jinny? Why aren't you sleeping?" "I... I couldn't. I don't know why. Um... why aren't you sleeping?" "I guess, since I don't feel like throwing rocks at anyone at the moment, I should just sit up and savour this feeling for as long as I can." "Not much of a talker, are you?" "No, not really." Lae caught just a hint of a sting in Jinny's voice. "It's okay, I'm not either. I mean, I used to be, but things just kinda happened... and well, you know, you just kind of lose your spirit for a while and your will to talk along with it?" "Um... no, I don't know. I've hardly ever wanted to have a proper conversation my whole life. But..." Her voice grew even quieter, apprehensive. "Uh, what do you mean by 'lose your spirit'?" "Oh..." Akorri hesitated. "I didn't expect you to actually ask me. You don't strike me as the inquisitive type." He paused again. "Well, you already know I'm a coward, right? I used to be much worse. Selfish. I ran out on my friends when they needed me most and basically lived with guilt the rest of my life. Until Lae and I faced Vacerus, that is, and I looked the big beast in the eye and didn't back down!" "I was surprised I didn't shrink away. I don't know, a part of me probably got tired of living with what I'd done and finally decided to take a stand. But I think the main reason I didn't back down was because I was with Lae." Laerya barely stopped herself from squeaking with surprise. She wanted to see where this would go. "When I saw how scared she was, it gave me courage. Lae, the normally fearless explorer whose only phobia seems to be of tunnels, didn't look danger in the face like she normally would. She cowered." This time Lae had to stop herself from protesting. 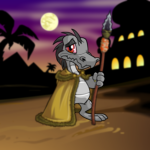 Any sane Neopet would have cowered! she thought indignantly. "And because she cowered, I thought I should be the one to be brave for once. So I did it. Belted Vacerus right on the nose!" A swishing noise rushed past Lae's ear and she guessed Akorri was imitating his feat for Jinny. The Kyrii murmured in approval. "And now I feel like I've made up for my mistakes, so the old me is slowly coming back," Akorri went on, "if we can reach the library on time, that is." "I'm sure we will," Jinny said. "I'll get Shady to put an extra burst of speed to make up for the time we lost today." "I'm amazed you'd do this all for me," Akorri sighed. "You and Lae, and Kiyake and Shady, and Fericeus and the rest of Lae's family..."
"I would do anything for a friend." And Lae sensed that was where the conversation would die. Akorri wouldn't know how to respond to such a heartfelt comment, and Jinny would feel awkward for even voicing her thoughts. Lae smiled behind her arms. She was right. Akorri mumbled his thanks and Jinny cleared her throat, and no one spoke for the rest of the night. A guide for when you don't know where to turn with your volatile Petpet.